Open every day. The entrance fee for divers is 10 USD. Toilets are available. There is a large parking area with tables to set up dive equipment. It is 60m/200ft walk down a good path and concrete stairway to the water from the parking area. Permanent Cavern line. Maximum depth 15m/50ft. Halocline depth 12m/40ft. Chikin Ha is located 10 minutes south of Puerto Aventuras on Highway 307 very close to the entrance of Kantun Chi. From the turnoff a very good 3km/2mile dirt road leads out to the car parking area 10 minutes into the jungle. Chikin Ha means "Western Water" and this cave system is just upstream of Sistema Ponderosa. In fact the two cave systems are only separated by a short area of collapse and the first cenote you will see on your arrival is Cenote Xtabay which is actually a part of the Ponderosa cave system. Xtabay also has a large cavern zone which can be dived but no permanent cavern line so it is a good location for divers taking a Cavern Course to practice with their reel and line laying skills. If you continue on the path past Xtabay you will come to Chikin Ha. Chikin Ha is a very large half moon cenote with a massive undercut ceiling and crystal clear water. 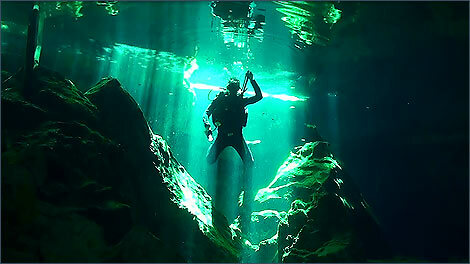 The permanent guideline begins in the open water of Chikin Ha and traverses over to Cenote Arcoiris (Cenote Rainbow) through a large halocline tunnel. At Arcoiris the line runs along the edge of the cenote giving you a great view of the calcite rafting and large breakdown formations. The permanent line then returns back to Chikin Ha on the opposite side of the halocline tunnel as you go over and around massive breakdown piles decorated with fossils, crystal formations and speleothems. The line ends up at the far end of the cenote from where you entered and you can either make your exit here or swim back to the original entry point on the surface while admiring the many colorful birds that live in and around the cenote. Look out for the Mayan cenote bird, the Motmot, with its distinctive call, iridescent turquoise plumage, and racquet tail feathers. Easy - perfect cavern to start with on a sunny day. 15 meters / 49 feet. Chikin Ha with the connected Cenote Rainbow are showing their beauty especially on sunny days. A beautiful place to shoot .